Established in 2000, SOZO is a digital marketing company based in Cheltenham and London, specialising in web design, branding, and digital marketing. We are very pleased at SOZO to announce we are now officially recognised as a certified Google Partner. 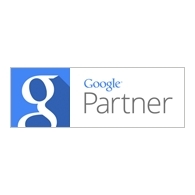 Google Adwords Partner in Cheltenham and LondonTo become a certified Google Partner requires an advanced knowledge and understanding of Google Adwords. This is combined with evidence of high performing campaigns that utilize tools provided by Google Adwords to help maximise ROI. In addition, the certification requires having to pass a minimum of two very challenging Google Adwords exams. We are very pleased to have met the criteria, and to be officially recognised as a certified Google Partner. Here you can view our official Google Partner profile, as well as our Google+ business page. As a branding agency, our job at SOZO is to create – or enhance – your image. We’re passionate about designing brands that create real impact and reflect what your company is all about. A strong brand is an essential tool in helping you to stand out from your competitors and to communicate to your customers why they should buy from you. Good branding can be attained through your company’s name, logo and slogan, and should be continued through all communication activity, including your online presence, visual identity and tone of voice adopted at all public touch-points. Key objectives of successful branding include: To convey your company’s message clearlyTo confirm your company’s credibilityTo connect emotionally with your target customersTo motivate consumers to engage with youTo encourage customer loyalty At SOZO, we understand what lies at we heart of successful branding – appreciating the needs and desires of your prospective customers and clients. We provide a full branding agency service in-house and can design an entire visual identity for your company, along with a cohesive brand strategy that helps get across your core messages. Digital marketing is all about drawing potential customers to your website and converting those visitors into sales. We have various methods of achieving this, including search engine optimisation (SEO), Facebook marketing and e-newsletters. SEO is an area where we have vast experience. We have achieved thousands of first page Google natural listings for some very competitive keywords. We offer a comprehensive SEO service that gets you on the first page of Google for your most relevant keywords. The service covers all aspects of SEO from natural listings, link building and sponsored links through to website optimisation. The service is not just about getting you on the first page of Google but focused towards converting visits into sales. Over the past 14 years, we have helped many companies to dramatically increase their visibility through search engine optimisation and intelligent digital marketing. To discover how we can improve your digital marketing, please contact us. As a certified Google Partner we offer a comprehensive monthly SEO service to help gain you page 1 Google rankings for your most relevant keywords. Our monthly service covers all aspects of SEO from keyword research, seo copywriting, credible link building, meta data and Google Adwords management through to client seo workshops. As a certified Google Partner with over 14 years' experience, we know exactly what search engines are looking for. In partnership with our clients, we then apply this knowledge to make your website as search engine friendly as possible. We have achieved some fantastic results for our clients in helping to maximise their ROI and business performance, with literally thousands of first page listings for some very competitive local & national keyword phrases. Our SEO service is very much focused towards converting visits into sales. It is not enough to simply be on the first page of search engines. We analyse website performance so that you have the best chance of converting good search engine positions into actual sales and enquiries. Having achieved Google Partner status, we are highly skilled and knowledgeable in the field of SEO and Google Adwords. This certification is testimony to the advanced understanding and experience of SEO shared by our team. For more information about our SEO services, and to learn more about how we can help your business thrive in search engines, please contact us.